From Iron Man on, the gajillion-dollar Marvel Cinematic Universe has toyed with portraying its characters as A-list and B-list celebrities or even actors cast in roles—a Hollywoodian fantasy where superheroes go to lunch, get asked for autographs, mingle at after-parties. (Avengers Tower is supposed to be in Midtown Manhattan, but its modernist-mansion interior screams “Hollywood Hills real estate.”) A lot of their foes are performers, too. Think the pathologically duplicitous Loki; the phony Mandarin, who literally turns out to be an actor; the camp stylings of Ultron; Hydra’s paranoia-stoking infiltration of S.H.I.E.L.D. It’s as much a part of the self-aware, thematically murky MCU house style as conspiracies, clashing egos, military-industrial Frankenstein’s monsters, sins-of-the-father backstories, and imminent planetary destruction. I’m not alone in thinking that most of these movies are pretty entertaining. The newest Marvel film, last week’s Taika Waititi-directed Thor: Ragnarok, is a lot of fun. It’s got airbrushed-poster-cheese effects, Douglas-Adams-esque aliens, a good sense of humor, a Skittles color palette, and the winning presence of Chris Hemsworth’s space-hunk Thor, the MCU’s Little Prince. It’s also got an assortment of MCU-isms that have become all too familiar after 17 feature films. Their escapism tends to take on conspicuously literal forms. The more colorful settings are alternate dimensions and distant planets (which is what we get in Ragnarok), but for the most part, the stories of the MCU seem to happen in high-tech labs, secret bases, ships, and other secure, undisclosed locations. And they’re often the same stories. The self-reflexive jokes about fame, celebrity, and merchandising are there—everything from a dressed-down Thor being recognized by fans on a street in New York to Bruce Banner (Mark Ruffalo), the Avengers’ resident shy-Method-actor-type genius, being menaced by papier-mâché likenesses of his raging green id, the Hulk, in an alien marketplace. The ending of the preceding Thor movie, Thor: The Dark World, is recapped in a play performed on Thor’s Norse-mythology-inspired planetoid, Asgard, with an uncredited Matt Damon as the local ham playing Thor’s adopted brother, Loki (Tom Hiddleston). The play, it should be noted, is put on by Loki himself. The most telling of the MCU standbys is the characters’ almost existential preoccupation with branding. Probably the most consistent, too. 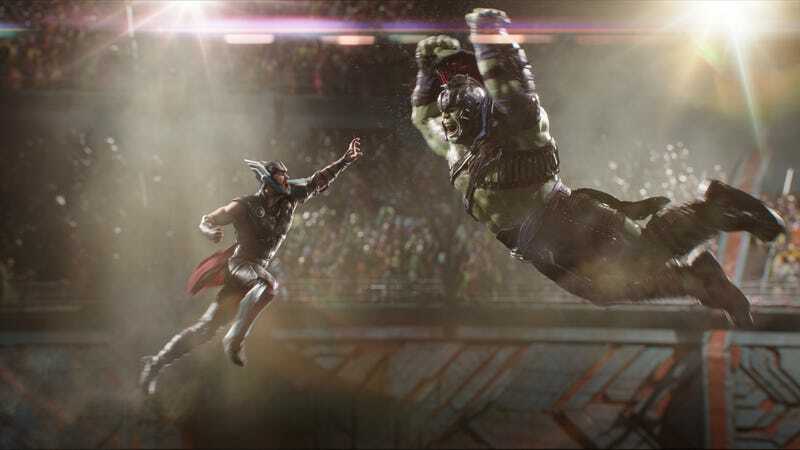 In Ragnarok, we get Thor minus his magic hammer, Mjölnir; the always tricky relationship between Banner and the Hulk; and a minor crisis of conscience for Loki , a bad guy who envies the adulation heaped on good guys. We’ve seen variations on these before. There’s the Avengers without S.H.I.E.L.D. ; Tony Stark (Robert Downey, Jr.) without his armor (for a time) in Iron Man 3; the stuck-up neurosurgeon Stephen Strange (Benedict Cumberbatch) without his hands in Doctor Strange; and so on. If the arc of a Marvel movie isn’t about a character stepping into a role, then it’s about them learning to make do without some essential part of their public persona. It’s all very meta: the superheroes as movie stars. Sometimes these crises are played for laughs (e.g. Peter Quill’s insistence on being called “Star-Lord” in Guardians Of The Galaxy) and sometimes for drama, as in the three movies centered on Chris Evans’ heroic Captain America (Captain America: The First Avenger, Captain America: The Winter Soldier, Captain America: Civil War), which follow his journey from Hitler-slugging song-and-dance propaganda act to fugitive. The three Captain Americas are among the most clearly articulated Marvel films, even if Civil War often gets bogged down by “Avengers-itis,” that need to involve as many characters as possible. Even Ragnarok works in an awkward cameo for Doctor Strange. Because if we weren’t constantly reminded of how many superheroes there are in the world of the MCU, would we even be able to tell? Yet the fact that the MCU repeats the same narrative tropes reveals something, even if it isn’t supposed to. Let’s take it as a given that superheroes are deeply unreal, and that this unreality is an essential to both the childlike appeal of the genre and to more grown-up considerations of it—your Watchmen- and Astro City-type attempts at imagining the social, political, historical, or psychological fabrics of a world where costumed crime-fighters exist. But to the residents of the MCU’s version of contemporary Earth, superheroes must seem as unreal as they do to us. Consider all of the things the average MCU Earthling would have witnessed in their own lifetime: Norse gods, alien invasions, major cities beings destroyed, advanced artificial intelligence, weird mutations, magical artifacts, super-soldiers, bizarre technologies. Yet what we see of life on Earth is basically unchanged, apart from the addition of a few CGI buildings, fictional politicians, and government programs. As in our world, superheroes are popular characters; they appear on merchandise, in museum exhibits, or in self-parodying educational videos, become scapegoats or spokespeople. They may as well be fictional within their own reality, inhabiting a bubble, the consequences of their actions written mostly in reaction shots of other super-people, their minders, and enemies. (Especially true of The Avengers, Avengers: Age Of Ultron, and Captain America: Civil War, which are veritable reaction-paloozas.) Every story has become a self-representation—an alternate-universe Tinseltown, the franchise about what it’s like to be in a franchise. Or, to borrow a striking image from Doctor Strange: a mirror dimension of infinitely recursing reflections.